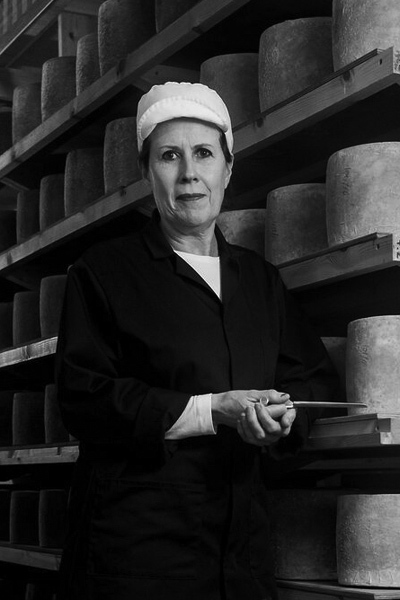 Tricia is the maker of Barwheys Traditional Ayrshire Cheese and one of our favourite suppliers. Like us, she is passionate about local produce! Barwheys cheese is an old fashioned cheddar made by hand by our small team of cheesemakers. The milk from our special herd of Ayrshire cows is naturally sweet and creamy and we don’t pasteurise the milk so it lends all of its lovely complex flavours to the cheese. It’s then matured for a year and this process increases the complexity of the flavours. It isn’t just us that think that Barwheys is great – we have won Gold medals at the Royal Highland Show for the last 6 years and we have also won Best Scottish Cheese, Best Scottish Cheddar and Reserve Champion cheese at various times. In times past the cheese industry on Ayrshire was booming with most dairy farms producing cheese. Nowadays there are only 2 of us producing traditional handmade cheese in the whole of Ayrshire. Buzzworks have always been really supportive of local producers – and they always name the producers on the menu which helps to build awareness. They are very creative in their kitchens, coming up with great new ways of using local produce. My favourite venues are Elliotts and Lido. I love fish and tapas – style dining and both are flexible and unstuffy but serve great food!